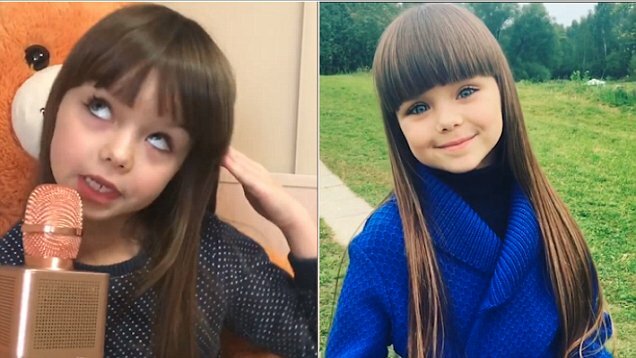 A six-year-old from Russia has been hailed the 'most beautiful girl in the world' - following in the footsteps of French model Thylane Blondeau. Anastasia Knyazeva has already amassed a legion of fans online, who have been wowed by her doll-like features and striking blue eyes. The youngster is a successful child model, having starred in a number of campaigns including for Russian brand Chobi Kids. It comes after Thylane, now 16, was famously named the world's most beautiful girl at the age of six - and became the youngest model to star in French Vogue. Anna regularly posts photographs of the six-year-old's photoshoots, as well as snaps of her backstage. Each photograph receives hundreds of comments about the youngster's striking features, from fans as far as Indonesia and Brazil. Anastasia's mother has been sharing photos of her little girl since July 2015, when the burgeoning model was four years old. The youngster has already modelled for major brands in Russia, including Amoreco and Kisabiano. She was also voted the face of Little Miss Aoki, a line from luxury children's couture house Mischka Aoki, in October last year. Some fans have already suggested Anastasia, also known as Anna, could one day take the crown of Russian model Irina Shayk, who rose to fame in 2007 when she became the face of Intimissimi. Despite the enormous support on Anastasia's official Instagram page, some have criticised her mother for letting her daughter model, as well as wear make-up, at such a young age. 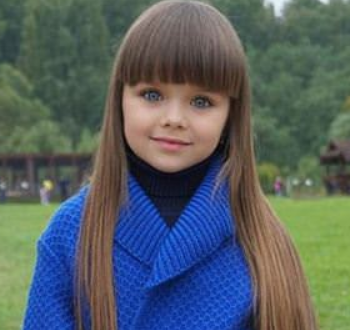 One person wrote: 'I'd like to know how much make-up her parents give her before each photo'. Another young Russian model, Kristina Pimenova, previously sparked controversy after she described the most beautiful girl in world at the age of just nine. The youngster, who is now 11, later secured a lucrative modelling contract in the US with LA Models. However, her mother was forced to hit back after she was criticised for publishing 'provocative' photos of her daughter on social media. Despite her young age, Kristina has already had an enviable career having graced the cover of Vogue Bambini when she was seven and been the face of Roberto Cavalli, Dolce & Gabbana, Armani and Benetton, among others.